Knitting Needle- helpful but not a "must have"
Step One- Gather up your supplies and make sure that your fabric and trim choices are what you want. Step Two- Cut your fabric. These dimensions I give will make a skirt that is 13.5" long from top to tip of lace when finished when using 1.75" lace. My lace was about 1.75" from top to bottom, minus seam allowance of 1/8". Be sure to adjust your lace measurement depending upon the trim you use if you want it to be exact. (I'm an "eyeballer" myself.) 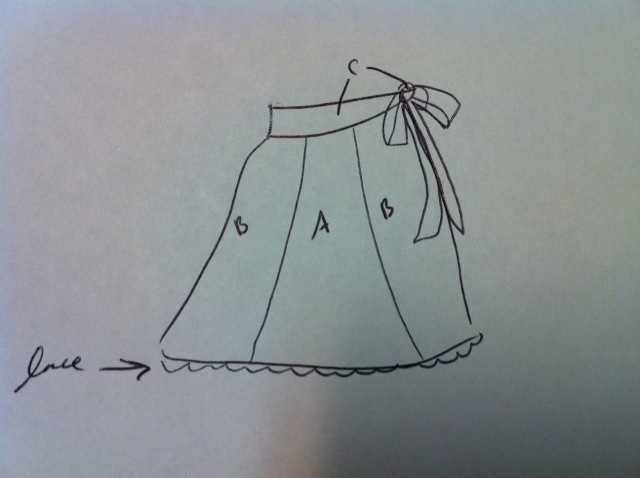 If you want a longer skirt, add or subtract the length you want on top of the 13.5" to the width of colors A & B. 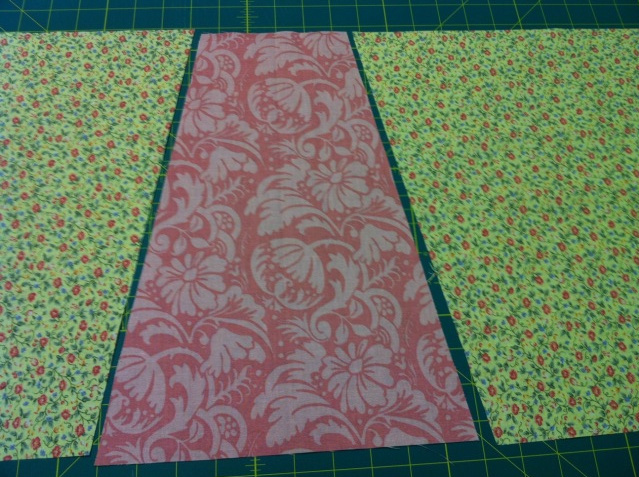 Step Three- Take your piece of Color A (the middle panel) and fold it in half, right sides together. Using your ruler and disappearing fabric pen (I used a ballpoint on this one b/c the dot is super tiny and will disappear into your seam), mark 2.5" in from the fold. Fold is on the right in this photo. Then, line your ruler up from the dot you just made down to the bottom left corner. Cut. After making sure straight edges line up and both pieces are flat and smooth, lay acrylic ruler on top of Color A and cut Color B. Step Six- Pin Color A onto left Color B, right sides together and sew seam. Then do the same to the right Color B piece. Pinned to Color B Sew 1/4" seam. 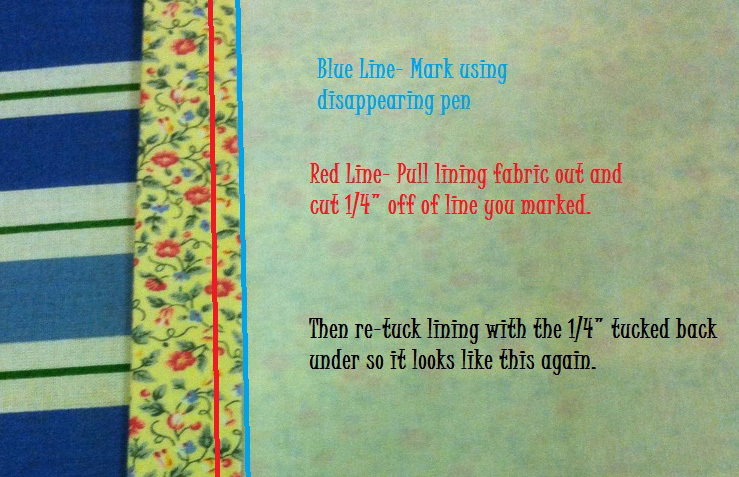 Step Seven- ﻿ Measure the length of your panel and cut lining fabric to the same length and width. Step Nine- Fold skirt right-sides together and pin edge, lining up trim. Sew seam. Then, fold up lining right -sides together and sew that seam as well. Step Ten- Starting at the back seam, line the two seams on the lining and skirt together. 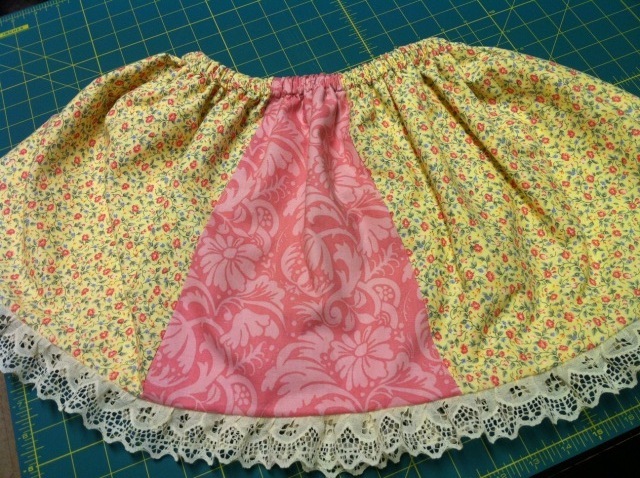 With right sides together, sandwich the trim in between the lining and the skirt, lining up the raw edges. Pin together. Then, flip the skirt so you can see the seam that you sewed on the wrong side of your colored (not lining) fabric when you sewed your trim to it. Use that seam as a guide to stitch all three layers (main fabric, trim, and lining) together. The seam is kind of hard to see b/c I used white thread. Stitch down all three layers together. Step Eleven- Flip up lining and press the skirt lining side out (right side of main fabric on ironing board, lace trim out. Then, press top seam 1/2" down around the entire top of the skirt. Flip down again another 1" and press again.﻿ This will be the casing for your elastic. Step Twelve- I forgot to take pictures for this step since it was getting late and the kids were being well... kids. Use your acrylic ruler and disappearing marker pen to draw a line down the inside of your lining fabric right below the main fabric of your elastic casing. Then, flip up the pressed casing and cut 1/4" about the line on your lining fabric. After you've trimmed the lining fabric, tuck everything back, repressing the casing folds if you have to. Trimming the lining cuts back on bulk that you would have in your casing otherwise. Then, starting about 1" away from the back middle seam sew as close to the edge of the casing (the blue line on the photo) as possible, stopping about 3 fingers away from completing the circle around. Backtack at the beginning and end a few steps to make sure your stitches stay put. 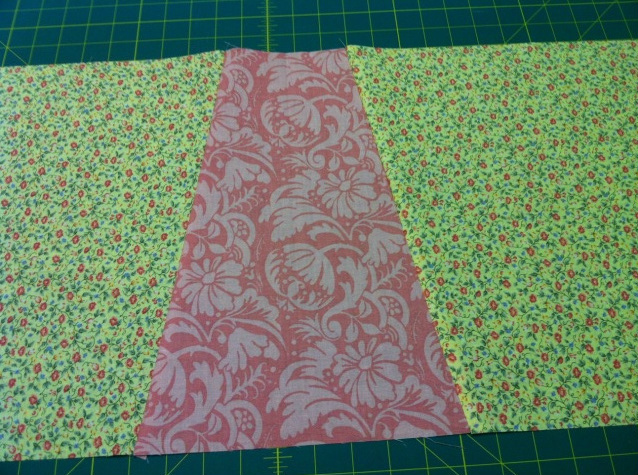 Step Thirteen- Cut your 3/4" elastic the same size as your child's waist. Pin one side of your elastic to the lining of the skirt, and attach a safety pin to the opposity side to help you thread it through the casing. Thread through, being careful not to twist elastic as you pull. I like to fold back my elastic edges before pinning so the pin won't rip through when you're pulling it through the casing. After pulling it all the way through. 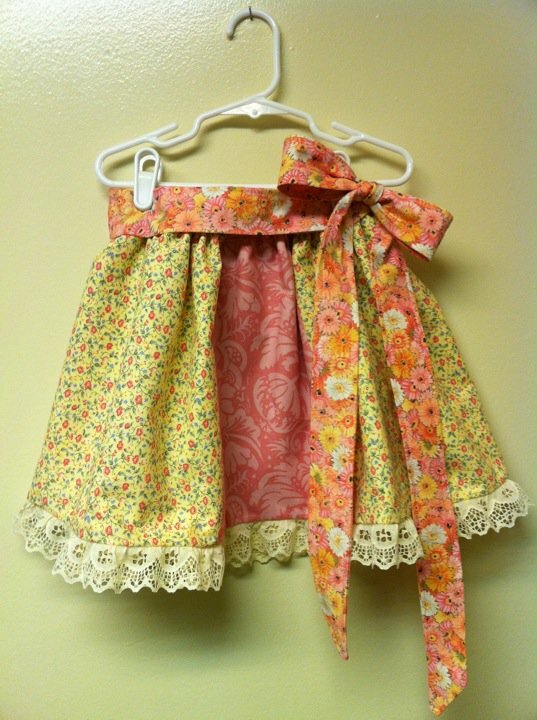 Make sure the elastic isn't twisted in any way and then sew it together back and forth a few times. Push it the rest of the way inside the casing and sew the gap you left closed. Step Fourteen- Take two of your four strips of Color C and put them right-sides together, lining them up.﻿ Use your ruler to cut one side at a 45 degree angle. Then, starting at the other end (the non-angled end), Sew 1/4" off the edge down the length of the strip, around the angle, and back up the other side. DO NOT SEW THE SHORT END CLOSED. Repeat with other 2 strips of Color C. Then, turn them right-side out. A knitting needle helps. Step Fifteen- Press your ties (Color C strips) flat. Then, tuck the raw edge inside of itself and sew closed. Repeat with other tie. Step Sixteen- Sew short ends (the ones you just tucked inside themselves) of the ties together and then lining them up with the top part of the skirt, secure to one side of the skirt. Now you can wrap the ties around and tie in a bow on the opposite side. I love it, and thank you for the tutorial.